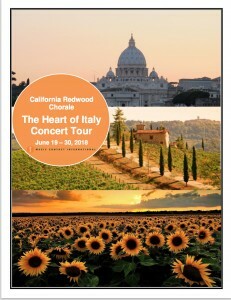 CRC going to Italy June 19 – 30, 2018! A few days in Rome for a “Roman Holiday”, then off to Tuscany to sing and enjoy! If you are a singer….even better! And you can bring a companion! Come to hear us sing “Carmina Burana” March 17 and 18 with Sonoma County Philharmonic. wow! Attend our spring concerts at the end of April. beautiful music! Travel to Italy with us in June. what a year!